Ultimately, we're not made of things but of processes; we're not objects or subjects, we are happenings. Both subject and object are complementary aspects of an experiential process. The process is fundamental whilst the subject and object are virtual appearances. The unified cosmic process (Brahman) has subject=God (Supreme Self) and object=quantum field (spirit world). This unified cosmic process operates 'between' moments of existence; changing the state of NOW so that it seems that there are many successive moments. As these moments blur together there seems to exist myriad individual experiential processes (Atman), which operate 'across' moments of existence. This is how Atman is Brahman, depending on whether we contemplate the process as operating 'between' or 'across' moments. When 'between' it is One, whilst when operating 'across' it is many. The individual experiential processes (Atman) have subject=Jiva (personal self) and object=Maya (phenomenal world). In this way the unified cosmic process seemingly animates myriads of virtual processes, hence the One manifests as many. Many subjects (embodied beings) and many objects (physical universe). But ultimately there is just one unified cosmic process, which can be known as either one subject (God / Supreme Self) or one object (quantum field / spirit world). Anyway, that is one possible English interpretation of the mathematics that I intuitively received and have been contemplating since 2000. The maths is crystal clear and very succinct but it is hard to find words to describe it because words have so much egoic / materialist baggage attached. BTW for much more detail see System Science of Virtual Reality. There are some who believe that only sentient beings such as humans can collapse quantum wavefunctions. IMHO this is a fallacy and it leads to a paradox, which can be resolved by developing a deeper understanding of consciousness. In fact any interaction with another system will collapse the wavefunction. Any observation will do it, because whenever an observable is required by another system as part of an interaction the wavefunction must collapse to provide an observable. This approach is a natural part of an efficient simulation algorithm, which only computes the state of a virtual system when another virtual system requires an observable in order to experience and interact with it. The sensitivity to collapse is why researchers are having so much trouble building quantum computers, they call it the "decoherence problem". In order to perform computations with wavefunctions we can't have them collapsing willy-nilly, but the slightest interaction with any aspect of the surrounding universe will collapse the wavefunction. So how can one develop a framework within which to compute with wavefunctions? If it was only sentient beings who collapse wavefunctions then the decoherence problem would be easy to solve, just put the quantum computer in an opaque box and don't let anyone open the box until the computation has had plenty of time to complete. Then a sentient being can open the box to collapse the wavefunction and observe the final result of the computation. This is not what happens in reality. The only way out of the quantum-sentience-paradox is to accept that not only complex systems with complex forms of awareness (such as ourselves) are involved in the collapse of the wavefunction, but even simple systems with simple forms of awareness. Hence the way out of paradox is to overcome anthropocentric concepts of consciousness and accept some form of panpsychism, such as pan-proto-experientialism. Even a fundamental particle has its own primitive form of consciousness - nowhere near as complex and rich as ours, but it is aware nevertheless. A particle couldn't interact with other particles if it wasn't aware of their existence and their state of being. It needs to observe their state of being in order to react to them, and this observation collapses the wavefunction of the other particles. Taking numbers consisting of 1's and squaring them reveals an interesting countup-countdown pattern in the resulting product. What does it mean to be a person with big karma? http://qr.ae/cmc What is karma? What does it mean that everything in the world is a teacher? http://qr.ae/0yV Sadguru - teacher within. Also “System Science of Virtual Reality” is a relevant ebook http://bit.ly/9XhElB for those who wish to explore deeper. At the bottom of this page there are also some other answers and my comments on them. 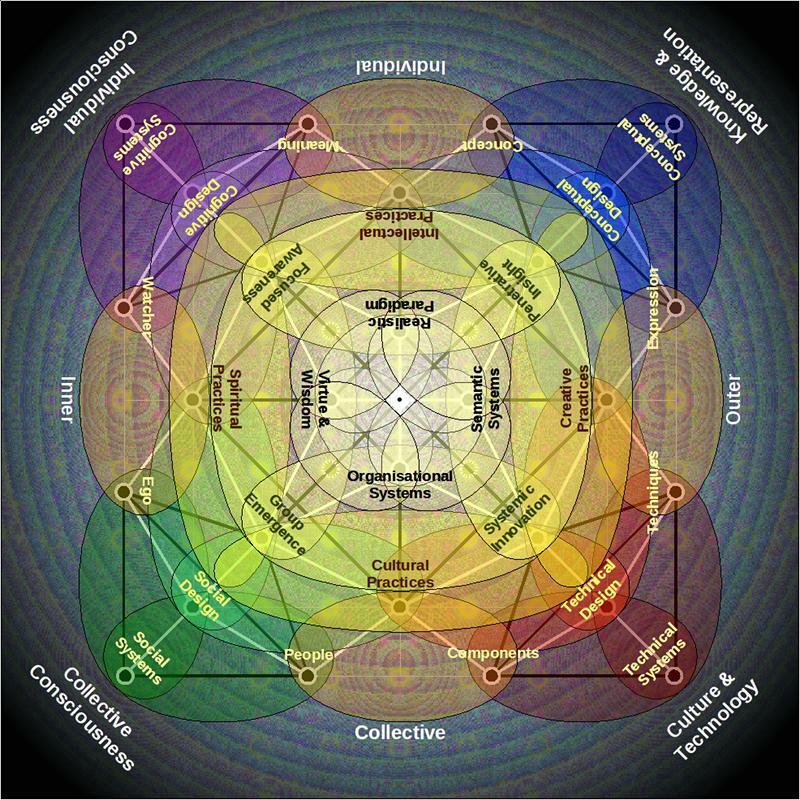 "The key is that effective co-creation needs to be organised. It doesn't self-organise..."
What is knowledge and what is to be known? What is a 'liminal' state? A 'liminal' state is when structures dissolve and the stream of events undergoes a creative process of change, resulting in the spontaneous emergence of fundamentally new forms and modes of being. Thus a 'liminal' state is the state of being in the midst of a radical, whole system, evolutionary, quantum leap. It is not a smooth transition but a radical discontinuity. For example, if one cuts open a caterpillar's cocoon one doesn't find a half-caterpillar-half butterfly, what one finds is a complex biological soup that is in a liminal state. Paradigm shifts also require such transformative leaps, where the old ways of thinking and being are deconstructed all the way down to the the fundamental assumptions from which they have grown. When these are dissolved by the clear light of awareness the new paradigm will emerge and flourish. This process is known to alchemists as VITRIOL, the “Universal Solvent”. It is from this acronym that the word vitriolic arose, to describe the action of sulphuric acid and its capacity to dissolve things into their basic constituents. What it means is that in any context, delve into the foundations of it, dissolve it into its fundamental constituents and underlying causes then seek to correct the situation at that deep level, then you will gain profound insight and mastery of that context. This is particularly applied in the alchemical context of self-awareness, self-knowledge, self-transformation and self-mastery. Self-Realisation, profound insight and effortless mastery are easily attainable, but only on the “other side” of a liminal state. If one simply builds upon the old foundation in new ways one only creates variations of the same old theme. To discover that which is truly new one must dissolve the old and let things go into a liminal state. From a response to a Facebook conversation about the issue of action, inaction, non-action, ego, doer, doership, etc. I just opened the Bhagavad Gita at random and it opened at chapter 3, "Karma Yoga: The Way of Action". The entire book is relevant to this issue however I will quote extensively from just this chapter because synchronicity is suggesting that it may be particularly relevant. First some background. Arjuna is a prince of a great kingdom that has disintegrated into two warring factions. Krishna, the avatar of the Supreme Godhead is serving as Arjuna's charioteer. A great war has arisen and Arjuna is called upon to lead an army to fight his kinsmen, his brothers, his teachers and those who he loves and respects. On the eve of the battle, in the midst of the two armies, Arjuna breaks down. "O Krishna, when I see these people, my kinsmen assembled here, eager for battle, my limbs sag, my mouth feels parched, my body quakes, and my hairs stand on end... I am unable to stand still and my mind is in a whirl. I see adverse omens, and do not forsee any good from killing my own kinsmen in battle... These I would not wish to kill though they may have risen to kill us. 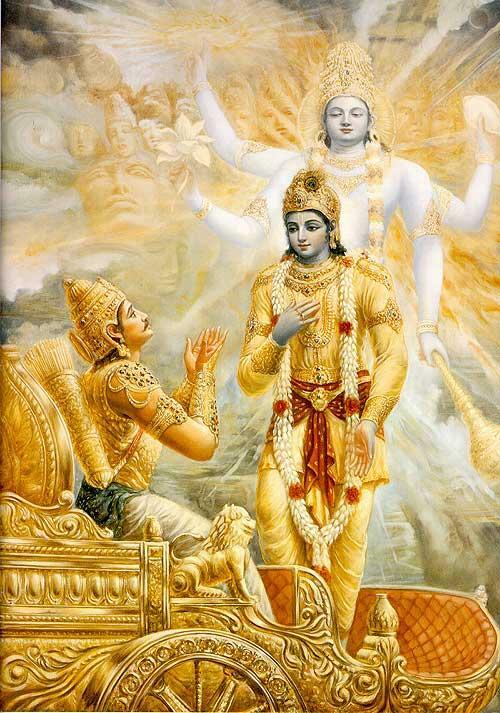 Even to obtain the kingdom of the three worlds (outer, inner & inner most); far less for the sake of the earth...."
Krishna's first reply is "O Arjuna, from where does this disgraceful conduct come into your mind in this hour of peril? It is unknown to the Aryas (awakened ones), does not lead to heaven, and brings one disrepute."